Hello! It's Hyaku-Legger here! This site is dedicated to Charlie B. Barkin's beautiful girlfriend, the most lovely female canine in the whole universe: Sasha!!! Now, exactly who is Sasha? 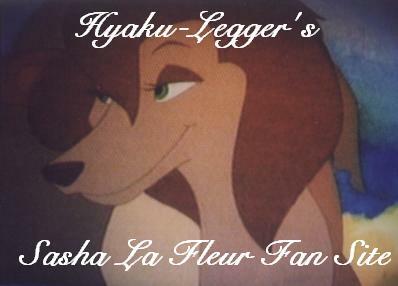 Well, to begin with, her full name is Sasha La Fleur, which would mean Sasha The Flower in English(and the name suits her perfectly). She is from San Francisco, California, and use to live alone in the tool shed of an old abandoned yard. But not anymore. Now she lives happily with the love of her life, Charlie B. Barkin. Why do I love Sasha so much? It's difficult to say exactly why, for even I don't know for sure. She is so kind, loving, caring, sweet, beautiful...I could go on forever. I simply adore this character for who she is. Sasha's voice is also very special. It is so beautiful, it sounds like a melody that soothes the heart and heals the most deepest sadness. And that is just what her voice did. Healed Charlie's sadness, and replaced it with a lovely feeling that he never felt before. Sasha's most famous frase is: "Oh, Charlie". She uses this frase to express many things. Sometimes sympathy or sorrow, and other times happiness and warm feelings. When Sasha is inmensely happy to be with Charlie and wants to tell him, but she can't express herself in words, she usually uses this frase. It means a lot to both of them. In resume, Sasha is the most lovely setter in the universe. But her true happiness resides in Charlie. Sasha loves Charlie more than anyone else in the world. He means everything for her; and she knows that Charlie loves her back in the same way, and would give his life to protect her. Sasha gives thanks to Heaven and she considers herself the most fortunate girl in the universe for meeting Charlie. In fact, she won't tolerate and will not permit anyone to speak badly about him, absolutely no one. Charlie is the very center of her life, and she knows that she is the very center of his. Well, that's about all I can say. Please, link me with this banner. It's a little big, but I hope you don't mind(hey, did I ever say that before?). Oh, and...click on this banner to enter my site. Brace yourself! This whole site is brand new!!! And while I'm at it, I'll tell you when my site is updated in this section, just so you know. Why I decided to build this site? I started with my Balto & All Dogs go to Heaven Site. Many people liked it, and many people didn't. Personally, I'm really proud to own that site. Well, I always loved Sasha. She is so special and so singular, so I decided I simply had to make her a page. And I did. I think Sasha is the sweetest and most special female dog in all the universe, and I'm eternally happy that Charlie and her fell in love. But, not everyone thinks the same. Another reason why I decided to build Sasha a page was to show people that Sasha deserves a lot more than we imagine, and try to make people understand that she is far more than just a pretty face. No offense to the other Fan Site owners. There are many sites that, instead of talking nicely about Sasha, make unpleasent remarks, and that makes little old me hit the roof with fury. Nobody quite understands Sasha completely, and especially in what refers to her relationship with Charlie. I'm not suggesting that my site is better than any other, in fact, maybe I'm the one that misunderstands Sasha, but I believe in what I stand for, and that's what I live by. I must remind you of something, I don't like the series and am totally against it because I consider it unfair. In the series, Sasha is completely different from the Sasha in ADGTH2, and those differences aren't exactly pleasent, and it's especially noticed when she's with Charlie. Cynical remarks, sarcasm, and generally unpleasent things happen between them. I honestly felt so down when I saw the series, and I still remember the feeling. But, I try to mend that by writing fan fiction, and it seems to work fine. I love Sasha and Charlie, and all I want is for them to be happy. I value them very much, beacause they are the ones that saved me from my own empty past life. My life would have been empty and sad and I would probably end up being a juvenile delinquent or something if it wasn't for them. They taught me the true meaning of love, and showed me a path that I would have never seen before. I don't know if I'll ever be able to thank them enough for all the things they had done for me, so this is just a little way to say 'thank you', making them nice sites for people to go and be able to understand the true meaning of their love. That's all I can do for now. In the future, I'm thinking of making my own animated movie, trying always to make people understand what's really important in life. Yes, I owe my life to them. They are my guides. Well, that's all there is to say. I hope my Sasha site is nice, and I hope it inspires other people that think the same as me to give Sasha the respect and value that she deserves. Thanks for reading.